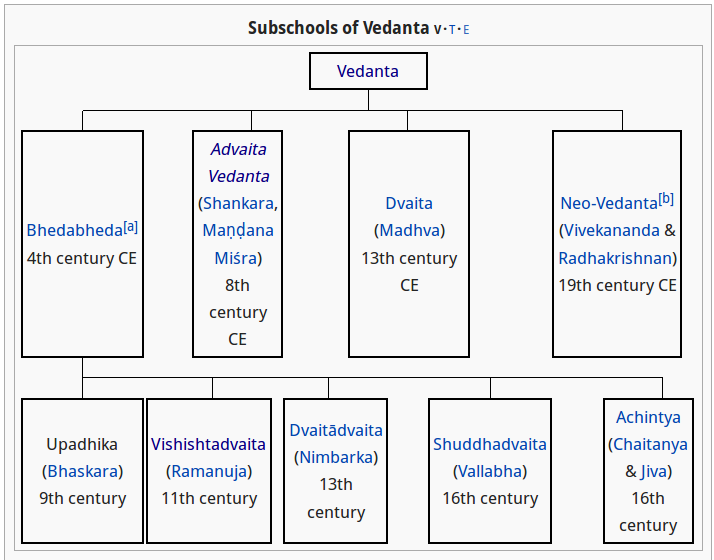 Among them Advaita (अद्वैत) & Vishishtadvaita (विशिष्टाद्वैत) are the most popular schools of Vedanta. I know about Advaita Vedanta but don't about Vishishtadvaita much. I want to compare both philosophies and study the difference between them. So, What are the differences between Advaita & Vishishtadvaita ? The following article by Balarama Murty Vempaty discusses the three philosophies - Dvaita, Vishishtadvaita and Advaita. It also talks about the role of Karma, Gnana and Bhakti in these philosophies. "deha bhudhaya dasoham, jiva bhudhaya tvamansha; atma bhudhaya tvamevaham, iti me nisicat mati"
This sloka sums up the connection between the three systems of philosophy Dvaita, Vishishtadvaita and Advaita as they illuminate Bhakti , Sraddha and Jnana, the very fundamental traits needed to realize God and enjoy the Bliss. Hanuman’s life through his different roles exemplifies how all the three paths of Karma, Bhakti and Jnana lead to salvation!. Let us go over the meaning as it relates to three philosophies. "From the standpoint of the physical body, I am His servant”; there is a difference between the Lord and me, as the name and form are different. The Lord is my master and I am indeed His servant. This is the Dvaita philosophy followed by Madhvacharya and several others. From the standpoint of a Jeeva (Soul), an individual dwelling in the body, I am the one conditioned by the mind and intellect which are always centered upon You, I am the part and You are the whole. This is fundamental to Vishishtdvaita followed by Ramanujacharya and others. But from the standpoint of the Atman, the essential Self, I and the Lord are one and the same. There is only one, that is Ananda, Pure Bliss! This is my firm conviction.” This is the concept of Advaita philosophy followed by Adi Sankaracharya. The interpretations in bold letters are mine. Many scholars and philosophers have debated the fundamental relationship between God, Man and Creation. The unity of existence is one of the great themes of Vedanta and an essential pillar of its philosophy. Unity is the song of life; it is the grand theme underlying the rich variations that exist throughout the cosmos. Whatever we see, whatever we experience, is only a manifestation of this eternal oneness. The divinity at the core of our being is the same divinity that illumines the sun, the moon, and the stars. Karma, Jnana and Bhakti are major ways to explore and understand that divinity at the core. Karma and Jnana are the basis of Vedas and Upanishads. Bhakti is a post-Vedic concept evolved through the blending of Karma (found in Vedas) and Upasana (found in Aranyakas). Bhakti is fundamental to Dvaita and Vishishtadvaita. The Alwars are the most ancient Vaishnava poet-saints of Tamilnadu who with intense devotional love for Vishnu sang the mystic glory of the Lord. The Divya Prabandham, a collection of hymns of Alwars, is placed side by side with Vedas by Vishishtadvaitins. Later theologians of Vaishnava faith tried to combine Karma and Jnana aspects with Bhakti and thus came Vaishnavism followed by Ramanujacharya and Madhvacharya. Chaitanya Mahaprabhu popularized Bhakti in the North as well. Bhaktiyoga is defined as the ‘continuous stream of remembrance of God, uninterrupted like the flow of oil and characterized by the eight fold limbs of Yama, Niyama etc.’ Adi Sankara, who propounded Jnana as the only basis for salvation defines Bhakti in Vivekachudamani as ‘Svasvarupaanusandhanaam Bhaktirityabhidhiyate’ meaning the same continuous flow of thought ‘Thou Art That’. We shall examine how these definitions apply to the three systems of philosophy below. Dvaita Philosophy: According to Madhvacharya, the Dualist, the Universe and the living souls are separate from God. Madhvacharya speaks of living beings as the servants of God and advocates the reality of five-fold differences between: 1) Individual Soul and God, 2) Soul and Soul, 3) Soul and Matter, 4) God and Matter, and 5) Matter and Matter. This is the basis on which we mentioned that Dvaita philosophy is based on body level perspective as seen and felt by the senses of the relationship between God, Soul (Man) and Matter. In this philosophy the Supreme Being is Vishnu or Narayana. HE is the personal first cause. HE is the Intelligent Governor of the world. He lives in Vaikuntha along with Lakshmi, His consort. Chaitanya Mahprabhu and others also follow this kind of approach. Under Dvaita philosophy, the Soul (Jeeva) upon liberation does not lose its distinct identity, which is different from Vishnu, nor does it become equal to Him in any respect. It is most appealing to the common man irrespective of caste or creed since it is based on intense devotion, Bhakti, that ultimately leads to Jnana and Salvation. Vishishtadvaita Philosophy: Visistadvaita, or Qualified Non-dualism, according to Ramanuja, accepts the ultimate Reality to be Brahman; but the individual souls and the universe (Matter) are also real, being parts of Brahman or modes of His manifestation. Brahman, with the universe and the individual souls, constitutes the whole of Reality. The metaphor of the pomegranate fruit is chosen to illustrate the philosophy of this school. The seeds are the living souls and the rind is the universe and one cannot think of the fruit without the seeds and the rind. A Visishtadvaitin wants to become like Lord Narayana and enjoy the divine bliss. He does not wish to merge himself or become identical with the Lord. He wishes to remain as a spark or a ray of HIS Consciousness. Bhakti and Prapatti (total surrender) are the means of achieving salvation. Advaita Philosophy: According to the Non-dualist, Brahman or Pure Consciousness is the only Reality; the universe of names and forms is unreal, and man, in his true essence, is one with Brahman. Sankaracharya proclaimed this as as “Brahma Satyam Jagat Mithya Jeevo Brahmaiva na parah”. An Advaita Jnani merges himself and becomes one with Brahman just like all the rivers lose their identity once they merge into the big Ocean. His goal is to become identical with Brahman. It is based on the definition of God as ‘Ekam Eva Advitiyam Brahma’ (one and only one Reality without a second) given in Vedas and supported by the four Maha Vakyas of ‘Brahma Sutras’, namely, ‘Prgnanam Brahma’, Aham Brahma Asmi’, ‘Tat Tvam Asi’, and ‘Ayam Atma Brahma’. For our purpose we can say that they all mean the same that is: The Atma meaning Consciousness is all pervading and the same Consciousness is also in me with no difference. In conclusion, all schools of philosophy specify the rituals, pujas, havans, bhajans etc., to cleanse the mind of impurities (Chitta Suddhi) as the first step. The next step is really to develop practice of intense Bhakti to steady the mind on saguna Brahman (Ishta Devata or God). The last step of complete surrender to or merge in the nirguna Brahman is where the differences appear in the three philosophies. After reading this article, I would say personally I believe in a mix of Vishishtadvaita and Advaita. Many years ago, when I had just started meditating, I would have said that I believed in Dvaita. Sri Vishishtadvaita is the main principle of Sri-Vaisnav Sampradaye.and it is very beautiful described and easily can understand by anyone. There are total three types of Shrutis in Vedas/Scriptures: 1. Abhed Shruti ( Advaita)- Where Supreme lord (Super-Soul) and living-entity (Sub-Soul) is one they are not different from each other. 2. Bhed Shruti (Dvaita)- Where Supreme Lord (Super-Soul) and living-entity (individual soul) is not one but they are different from each other. 3. Gatak Shruti ( Vishishtadvaita)- It is Solution of above two opposite Elements (Abhed tatva & Bhed tatva) is truth . Sri Vishishtavaidta is based on Gatak Shruti.and this thing is also beautifully described in the Sri-Bhasya by the author of Sri-Bhasya, Sri-Ramanujacharya. Every Mysterious Elements ,principle & ArthaPanchak** are depend on Vishishtavaita Prinicple. If you will understand this main principle then you can easily understand all mysterious thing which is in Sri-Vaishnav Sampradaye.This Principal gives solution of Gatak Shruti even also gives a solution of the Abhed(Advaita) and Bhed(Dvaita). Generally people think that this principle is only applicable for those who belongs to Sri-Vaisnav (Ramanuja) Sampradya.But it's wrong, because this principle is already presented before it was invented. Sri- Ramanuja only put light on this principle through the help of Scirputers (Granths/Purans). As we know Shreemad-Bhagvad Gita is universally accepted.Elements which were described by Sri Lord Krishna to Arjun is all are Sri Vishitadvaita principle. Let's we will understand Sri-Vishistadvaita Principle from Shreemad-Bhagvad Gita. क्षेत्रज्ञं चापि मां विद्धि सर्वक्षेत्रेषु भारत। क्षेत्रक्षेत्रज्ञयोर्ज्ञानं यत्तज्ज्ञानं मतं मम।।13.3।। -And know Me also as the Kṣetrajña in all Fields, O Arjuna. The knowledge of both the Field and its Knower is, in My view, the highest knowledge. Even Sri-Ramanuja is also commented in Sri-Bhasya:" The Characteristics & Form of nature and soul are to live as body of Supreme Lord. -I am the Self, O Gudakesha (Arjuna —Conqueror-of-sleep), dwelling in the hearts of all beings. I verily am the beginning, the middle and also the end of all beings. Understand by Visishadivata: In the body there is one soul and also there is one super-soul who is also present within the body. ( Four-armed Visnu).So, That's mean Supreme Lord, living-entity(we) and nature is not one.It's rebuttal or disclose the principle of Advaita.And also it can't be distinct or apart like the body and soul can't be apart from each other.So, It's rebuttal or disclose the principle of Dvaita. -Distinct from these is the Supreme Person, described as the Supreme Self [in the Vedas], He who pervading the threefold universe, supports it as the Immutable One and the Lord. By Visishtadivata : Here it's rebuttal the Abhed Shruti ( Advaita). The Greatest man Supreme lord who is distinct from us.Even though he is enter in us and take care of us and also maintain our body system. So, we can directly understand from the Sloka Supreme Lord is different from us. -Becoming the Vaishvanara Agni, I function within the bodies of all living beings. In association with the Prana and the Apana, I digest the four kinds of food. By Visishtadivata : Lord Visnu is so Mercy-full that he enters in us as supersoul and digest the food which is taken by us.If lord is not distinct from us then how he can digest our Food?.So,It's rebuttal or disclose the principle of Advaita. If lord is distinct from us then we don't need to think of digest the food. It's means we are capable to digest food by oursleves. It's also not right.So,It's rebuttal or disclose the principle of Dvaita. The Visishtadvaita principle is tell us like as we can't discriminate the white color from the white clothes. even though they both are different from each other like same as Davita and Advaita can't be discriminate from each other. even thogh they both are different from each other and same as we and Suprme Lord Visnu are different from each other but also not differentiate from each other. There are so many slokas in Bhagvad Gita where we can see the principle of Visisthadvaita like 18.61,15.15,10.31,10.42,15.13,7.6 to 7.12, 9.4 to 9.6 and 10.41. Sri-Ramanuja the great saint we thankful to him because he disclose the confusion of Dvaita and Advaita. Jay Shreeman-Narayan. Jay Shree Krishna. Om Namo Narayan. Not the answer you're looking for? Browse other questions tagged advaita vishishtadvaita .